I thought I would add a page with some humorous yet serious advice. Hopefully you will not have to experience any of these situations. If anyone has any additional advice to add please feel free to email us and we will add it to this page. 1. Do not, no matter what you do, DO NOT trust the weather man!That is the only job that I know of where you continue to get a pay check even when you are consistently wrong. I'm probably too hard on these guys. They actually do a good job but seems like when ever I really need an accurate weather report things tend to be opposite of what was forecasted. Just hope for the best yet prepare for the worst. A great app to use is the My Radar app. This little app has been extremely reliable for me. 2. Don't sink the boat! This is an easy one to avoid yet it still happens on occasion. REMEMBER TO PUT THE PLUGS IN THE BOAT.A few years ago we were preparing for a show. As I backed the boat off of the trailer and pulled it over to the dock, I got out of the boat and stepped on to the dock. Thank God I just happened to look back at the boat only to notice water coming over the back of the boat. I immediately jumped in the boat and managed to find the plugs in the bottom of the boat and install them before the boat went under. If I had not looked back at the boat and instead walked away to lock the truck then the boat would have went under. Believe me when I say that I count my blessings! 3. When you arrow a large fish with one or more arrows be VERY careful when you get the fish on board. Fish are solid muscle. When you have one or more arrows in a large fish and you do not have the fish under control you will have a flurry of solid fiberglass arrows slapping around, very similar to nunchakas coming at you! Just recently a customer managed to arrow a 58 lb. grass carp. It took a couple of more arrows and a gaff to board the fish. As I was attempting to contain the fish I had one hand on the gaff and went for the arrows so that no one would get whipped or stuck by a nock. Well I let my guard down just for a second about the same time that the fish decided to show his muscle. 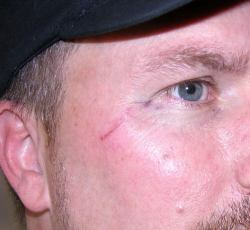 The result was a bowfishing scar to remember and a nice sting! 4. To date the only person ever to have taken a dip (fallen out of the boat) was one of my deckhands. It is advisable to bring a change of clothes just in case you decide to take an unplanned dip in the water. I have heard numerous stories about people falling out of their boat due to excitement, slipping or just losing their balance. A spare change of clothes will make the trip home more comfortable if this happens to you. 5. If you manage to arrow a large fish it would be advisable to get at least one more arrow in the fish before attempting to bring the fish on board. A large fish can rip just about any arrow out of him. Simply let him run with slack in the string as you ease the boat closer for another shot. The 'pain' portion of this piece of advice occurs when you lose a nice fish that could have been brought on board. This can cause one to say words that are not normally part of their vocabulary. 6. Always check to be sure that you have removed every item from the boat before you hit the road. No matter how many times I remind myself of this I tend to always leave something on the deck or dash of the boat and end up losing that item as I go down the highway. Then when you get home you become insanely confused because you cannot find your item. You know you had it before you left the lake. Then you try to kick yourself because the only other option is that you left the item on the boat and donated it to a pedestrian. 7. If you desire more fish on the boat, then AIM LOW! I can't make this more clear. Just A I M L O W!